Considered by many to be one of the top fly-fishing guides and fly-tying instructors in North America, Ian is famous for his razor-sharp Scottish wit and his down-to-earth fly-fishing methods. Well-known for his “no bull” approach to fly fishing, for 25 years Ian has shown folks how to cast, how to find fish and how to catch the fish they find. Ian calls a spade a spade, and a strike indicator a bobber. Ian caught his first fish on a fly, a Grayling, when he was 6 years old, from the River Clyde near the town of Motherwell, Scotland. Forty years of fly fishing have taught him a few tricks, which he painlessly passes on to his clients and students. For Ian a fish, is a fish, is a fish and all fish are created equally. Although he was the first guide in North America to specifically target Carp, Quillback, Gar Pike and Redhorse, he is just as comfortable taking clients out for, or talking about, Smallmouth Bass, Steelhead, Salmon and Brown Trout. He is constantly pushing the fly fishing envelope and many of the techniques he pioneered and developed, which were cutting-edge at the time, are now considered as “standards” in the sport. In other words, over some 40-years of fly fishing Ian has picked up a whole bunch of fish catching information on a whole bunch of fish species, which makes him a shoe-in if you are looking at hiring someone to lecture or present a seminar at your fly fishing event. More than once, Ian has been billed as “Fly Fishing Comic Relief,” but his talks also provide the audience with practical and useable information. Plus it’s presented in a clear and concise manner. 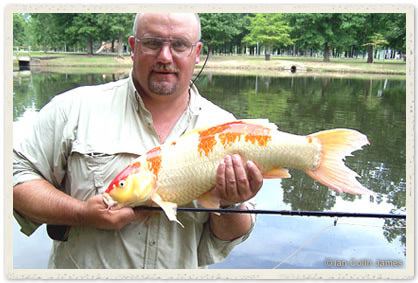 Across North America, Ian is also known as “The Carpfather” – the man who made fly fishing for carp popular on this side of the Atlantic, and for his best-selling book Fumbling with a Flyrod. At the recently completed 2006 Canadian Fly Fishing Championships he coached the Les Chiens d’Eau team to a silver medal. His experience with competitive fly fishing also includes being part of the Canadian Fly Fishing Team in 1995 at the 15th World Fly Fishing Championships in Galway, Ireland. That same year, at the Commonwealth Fly Fishing Championships on Loch Leven, Scotland, a fly he created took the largest fish of the event for his teammate, Tom Murray. Website: Visit Ian atwww.ianjames.info and don’t forget to read the hilarious Ask Ian pages and his Conservation Corner. Mail: Ian Colin James, P.O.Box 48034, Pond Mills, London, Ontario, Canada, N6M 1K5. City and Country Homes Magazine. Gigi Suhanic, The National Post. Mid-South Fly Fishers, Memphis, Tennessee. April Conrad, Hooked on a Cure, Arkansas.